Chiron (Alex R. Hibbert) was small for his age. The other kids called him “Little”. He was taunted and attacked for being small and different. Only one kid, Kevin (Jaden Piner) paid any attention to Chiron. Kevin and Chiron eventually become best friends. One day, after being chased by a group of bullies, Juan (Mahershala Ali), a drug dealer, finds Chiron hiding and takes him home. When Juan finds out Chiron’s mother Paula (Naomie Harris) is a crack addict, and one of his customers, Juan and his girlfriend Teresa (Janelle Monáe) take Chiron in. They give Chiron a place to escape if he needs to get away from his mother. When Chiron (Ashton Sanders) gets to high school, he is still dealing with his mother. He is still staying with Teresa from time to time. And he is still getting bullied in school. One day, a classmate, Terrel (Patrick Decile) convinces Kevin (Jharrel Jerome) to play a “game” where he punches someone until they can’t get back up. Terrel picked Chiron to be the target of this game. This leads to an incident that lands Chiron in jail. After being released from jail, Chiron (Trevante Rhodes) is following in Juan’s footsteps. He is now a drug dealer in Atlanta going by the name Black. When he gets a call from Kevin (André Holland), Chiron decides to take a trip to Miami. While in Miami, Chiron visits his mother and reconnects with his friend. 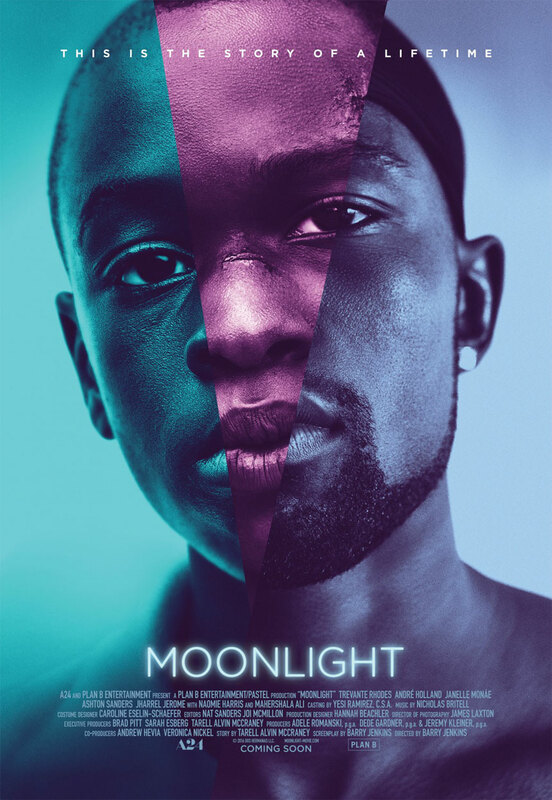 Moonlight is an attempt by writer/director Barry Jenkins to show the difficulties of growing up as a gay African-American in a neighborhood that expects you to be “manly”. This is a good concept, it just falls short on execution. The casting is just okay for the film. Janelle Monáe and Naomie Harris are the standouts in the film. Their performances far outshine those of their cast mates. Mahershala Ali is adequate as the drug dealer/mentor. The actors who portray Little/Chiron/Black in each of the chapters do what they can with the material they are given, which isn’t much. My biggest problem with the film is that it follows in the footsteps of fellow awards contenders Manchester by the Sea and Loving. For most of the film, Chiron’s role is simply standing and staring. He doesn’t do or say much of note. He is just simply there. This may be a character choice to highlight Chiron’s meekness and inability to fit in, however, it makes for a long, boring story. Moonlight is another of the films this year that is garnering a lot of praise that I don’t understand. There just isn’t enough to keep you invested in the story. See it simply to check it off the list of Best Picture nominees that you have seen.